Recently, the popular social networking and micro-blogging platform Twitter rolled out a new update which lets users see their interest the way the Twitter sees. Moreover, the users can ‘uncheck’ a listed interest and add ‘+’ a new one they want to receive more updates about. 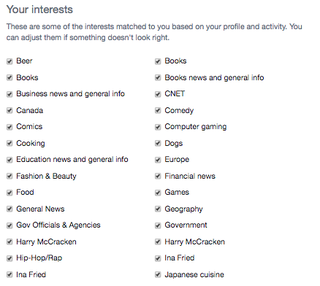 I, among the 328 active monthly users was quite surprised to see what Twitter thinks I like. For me, it showed that my interests are cars, watches, private islands, trip planning applications, and dance clubs. On the contrary, I am one of the people who shy away when asked for a dance. Finding myself in charge of my interests was a great thing. In this week, the social media platform’s recent update became more of a viral thing when users from all demographics started sharing the screenshots of their enlisted-interests among their peers and followers. Before the update, the facility of checking and modifying their interests in Twitter wasn’t available to users. The interests in the lists were accumulated by Twitter over a time of months and years to track users’ clicks to personalize the content and ads in the future. If you are a Twitter user and is certain to check your interest list, just click here. And uncheck the terms you are not interested in notifying about either by ads or content. For example, if you don’t want to receive notifications about travel app development company, just uncheck it and you would no longer be annoyed by travel-related content.